10 A None No Power Seat 10 A is a standard Business Class bulkhead seat whose proximity to the lavatories may be bothersome. 10 C None No Power Seat 10 C is a standard Business Class bulkhead seat whose proximity to the lavatories may be bothersome. 10 D None No Power Seat 10 D is a standard Business Class bulkhead seat whose proximity to the lavatories may be bothersome. 10 E None No Power Seat 10 E is a standard Business Class bulkhead seat whose proximity to the lavatories may be bothersome. 10 G None No Power Seat 10 G is a standard Business Class bulkhead seat whose proximity to the lavatories may be bothersome. 10 H None No Power Seat 10 H is a standard Business Class bulkhead seat whose proximity to the lavatories may be bothersome. 10 K None No Power Seat 10 K is a standard Business Class bulkhead seat whose proximity to the lavatories may be bothersome. 20 A None No Power Seat 20 A is a standard Economy Class seat whose proximity to the bulkhead may cause restricted legroom. 20 B None No Power Seat 20 B is a standard Economy Class seat whose proximity to the bulkhead may cause restricted legroom. 20 C None No Power Seat 20 C is a standard Economy Class seat whose proximity to the bulkhead may cause restricted legroom. 20 H None No Power Seat 20 H is a standard Economy Class seat whose proximity to the bulkhead may cause restricted legroom. 20 J None No Power Seat 20 J is a standard Economy Class seat whose proximity to the bulkhead may cause restricted legroom. 20 K None No Power Seat 20 K is a standard Economy Class seat whose proximity to the bulkhead may cause restricted legroom. 24 A None No Power Seat 24 A is a standard Premium Economy Class seat whose proximity to the bulkhead may cause restricted legroom. The proximity to the galleys may be bothersome. 24 C None No Power Seat 24 C is a standard Premium Economy Class seat whose proximity to the bulkhead may cause restricted legroom. The proximity to the galleys may be bothersome. 24 D None No Power Seat 24 D is a standard Premium Economy Class seat whose proximity to the bulkhead may cause restricted legroom. The proximity to the galleys may be bothersome. 24 E None No Power Seat 24 E is a standard Premium Economy Class seat whose proximity to the bulkhead may cause restricted legroom. The proximity to the galleys may be bothersome. 24 F None No Power Seat 24 F is a standard Premium Economy Class seat whose proximity to the bulkhead may cause restricted legroom. The proximity to the galleys may be bothersome. 24 G None No Power Seat 24 G is a standard Premium Economy Class seat whose proximity to the bulkhead may cause restricted legroom. The proximity to the galleys may be bothersome. 24 H None No Power Seat 24 H is a standard Premium Economy Class seat whose proximity to the bulkhead may cause restricted legroom. The proximity to the galleys may be bothersome. 24 K None No Power Seat 24 K is a standard Premium Economy Class seat whose proximity to the bulkhead may cause restricted legroom. The proximity to the galleys may be bothersome. 27 D None No Power Seat 27 D is a standard Premium Economy Class seat. 27 G None No Power Seat 27 G is a standard Premium Economy Class seat. 57 D None No Power Seat 57 D is a standard Economy Class seat whose proximity to the lavatories may be bothersome. 57 G None No Power Seat 57 G is a standard Economy Class seat whose proximity to the lavatories may be bothersome. This aircraft is configured with 53 flat bed Business Class seats, 32 Premium Economy Seats, and 308 standard Economy seats. Standard seat but airplane frame starts to get narrower at this point, so leg/feet room under seat in front is limited by 25-30%. This is not a good seat. I flew it on 25/26 Sep 2018 YVR-FRA. I paid for P/E, but there is no separate P/E cabin, or even a proper divider (just a quarter-height screen). So, I could at once see that Economy pax immediately behind received exactly the same meals, service, etc., as P/E. 0nly their seats were slightly narrower. My seat was very uncomfortable (I ended up sitting on folded blanket, and even my inflated neck roll, to ease pain). Impossible to get out of this seat without either disturbing or climbing over pax in 27H. A bassinet was fixed to bulkhead at front of P/E cabin and an economy pax was brought forward to sit there with her infant - which screamed most of night! No headphones provided, only cheap earbuds. Poor service overall. Unimpressed. Not value for considerable extra money paid. Overhead bins for the front 3 rows are not as big as standard bins and do not fit standard hand luggage sizes for LH. 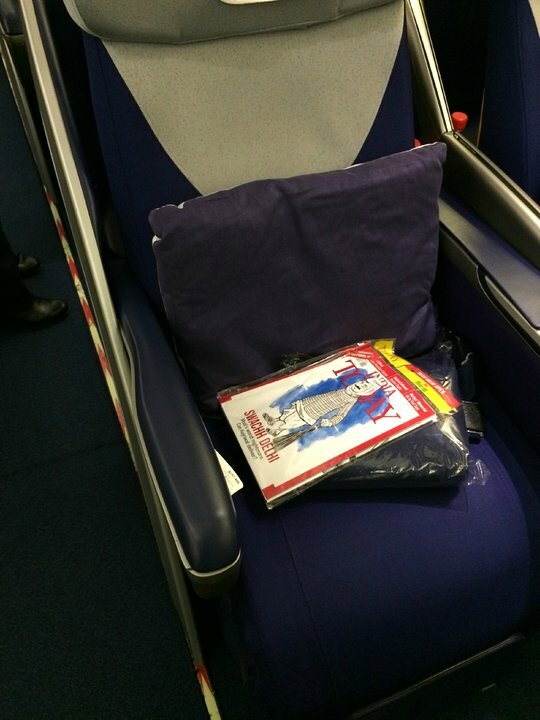 I flew in this seat on a FRA>SEA trip and to me, this seat is GREEN. it is located directly behind 53B, but as there is no 54A, you have an empty foot well in which you can store your personal item giving you a completely empty foot well yourself to enjoy for the flight. While the padding is a bit thin for a 9+ hour flight, the soft product that Lufthansa provides is excellent. I would have no problem flying this seat on a transatlantic long-haul again. 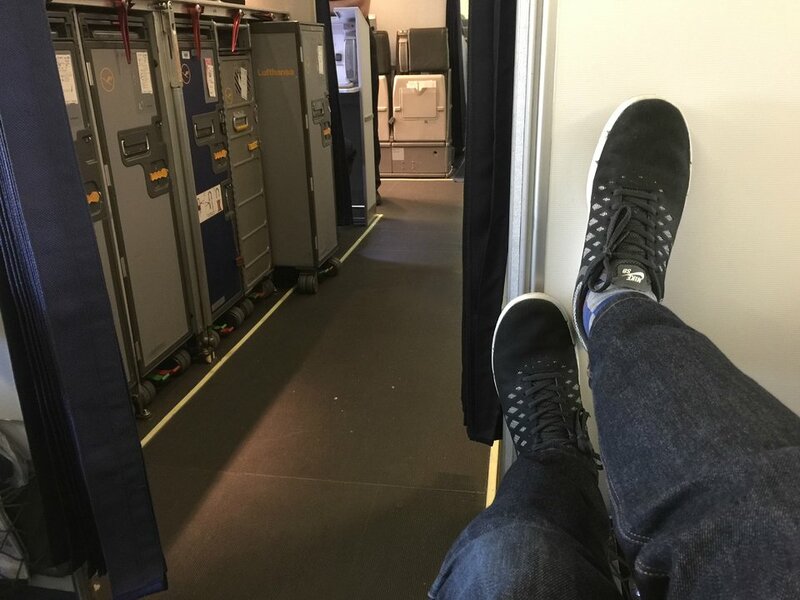 I paid for an upgrade to Premium Economy from SEA>FRA and ended up in this bulkhead seat. For me at 6'-3" it was far less comfortable than a standard coach seat. While the extra padding was nice, I found the legroom to be so restricted as to make this seat completely undesirable. In the future, if these seats were all that was available in PE, I would opt for coach any day. 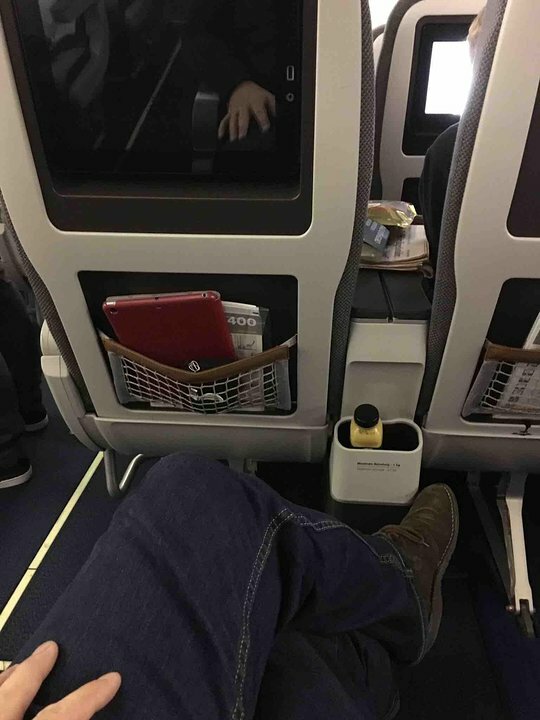 I normally fly Air Canada business class, and didn't check the seat configuration (or realize it was a LH flight). 4A is a window seat. When the neighbouring aisle seat is occupied by a stranger, who promptly falls asleep, you are stuck! You either have to wake them up, or climb over them (rather inappropriately). Fine seat if you are flying as a couple.... As it was, I was stuck in my seat for 6+ hours. All seats in row 29 provide extra legroom. Row 29 has the same seat-spacing to row 28 as in premium economy class. 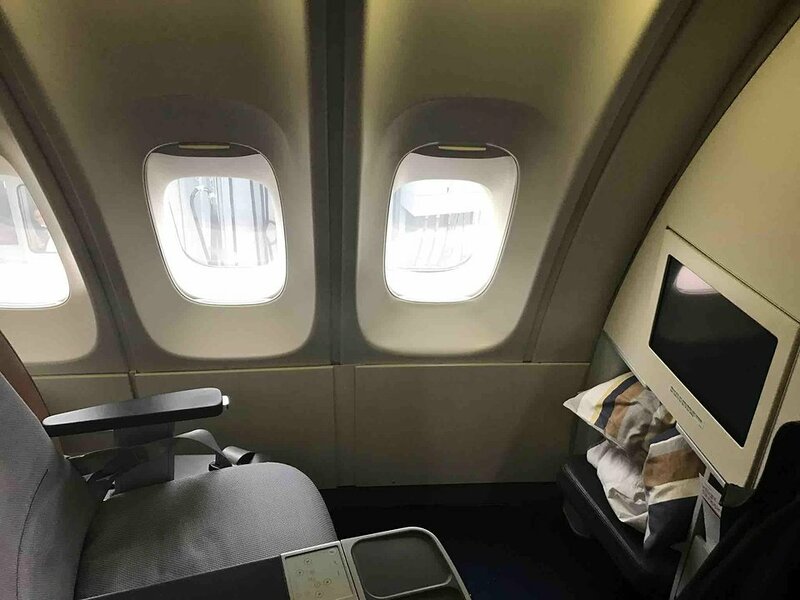 There is no bulkhead between the two rows, just a small divider above the seats. Only possible downside is a minimally reduced seat width due to the monitors and tray tables which are stored in the armrests. Not very comfortable seat. Because the reclination is limited due to the presence of galley. Very noisy due to the presence of crew with the trolleys in the galley. Would not recommend this seat. Is considered as a preferred seat but is actually narrow as it is located at the extreme of the nose of the 747. 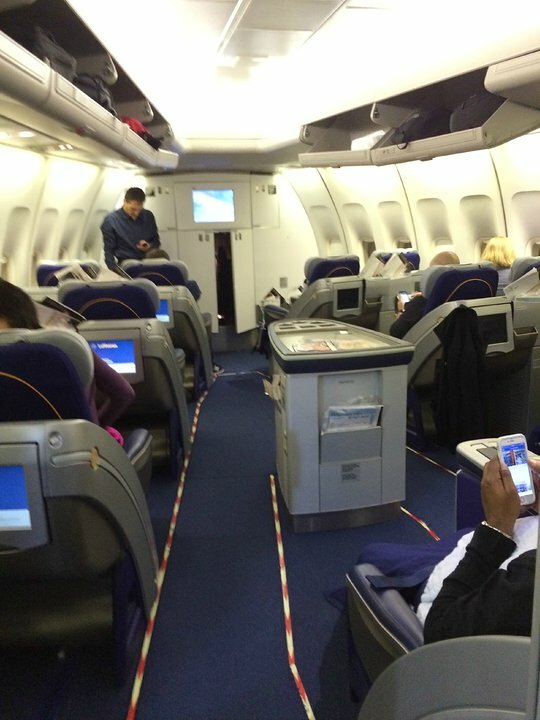 Row 29 has rigid seat dividers and are extra narrow. Legroom is great, width is uncomfortable. The light will not light up this seat and there are no individually controlled air vents. Great seat, I am not extremely tall (1.79 m) but I could almost fully extend my legs. Lots of knee space. Even though it is a window seat I could go to the bathroom any time without disturbing the other passengers in my row. Recommended.